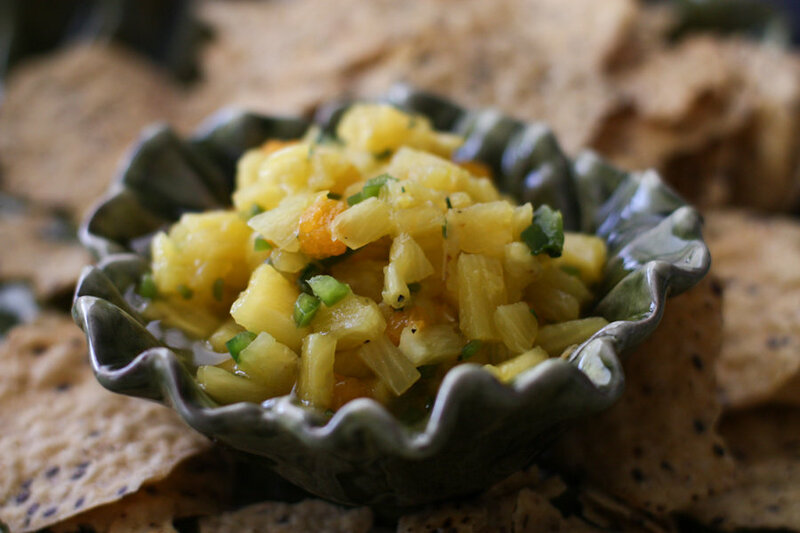 A fresh and fruity pineapple salsa with just a little kick. Pair it with your favorite tortilla chips or serve over grilled chicken or fish. Delicious! 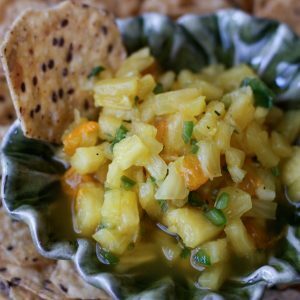 I discovered this amazing pineapple salsa a few years back when my friend Heidi brought it to one of our get togethers. I’ve made it several times since (when I’m not asking Heidi to make it for me) and it’s always enjoyed by everyone. Really, what’s not to love when you combine fresh pineapple with lime, jalapenos and cilantro – each bite truly makes your taste buds sing. Or break out into a little dance. Or whatever suits your fancy. 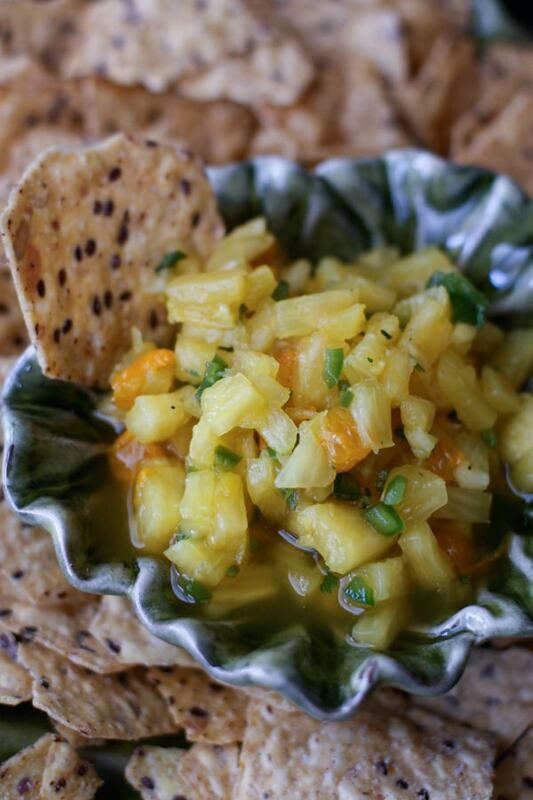 This pineapple salsa was part of a spread I put together for my husband Larry’s 40th birthday bash this past weekend. We celebrated my husband with all of his favorite things – food being a big part of it obviously. Our good friend, Rich, worked his smoker the day before the party cooking up a ridiculous amount of pork and beef that we served sandwich style with horsey sauce along with several bottles of Larry’s favorite barbecue sauces. In addition to this salsa there was this Cucumber and Feta Greek Yogurt Dip paired up with pita chips (my weakness!) as well as tomato and mozzarella skewers and fresh fruit skewers. We also picked up some glorious macaroni and cheese and cornbread salad from our favorite local BBQ place. There was some good eating going on. To say we had a great time would be an understatement. It brought me such pleasure to see my husband surrounded by all of his favorite people, dancing to his favorite music, watching clips from his favorite videos on the big screen, drinking his favorite drinks, eating his favorite food. Larry provided the entertainment – because in case you didn’t know, that’s what he’s good at – and we partied the night away. Since his birthday isn’t actually until this Friday, the 8th, the celebration continues this week…but in a little more low key let’s-go-out-for-fondue-with-the-kids kind of way. So, needless to say – this salsa belongs at your next party. Or barbecue. Or fiesta. Or Saturday night in front of the tube. Or whatever. Make it, eat it and be merry. Combine all ingredients in a large bowl. Taste for salt and pepper. Serve with your favorite tortilla chips, or over grilled chicken or fish. I absolutely love the Food Should Taste Good Multigrain Chips Tortilla Chips and they paired up perfectly with this salsa. I love that you posted this because just a couple of days ago I bought a Pineapple Salsa from the store… a totally expensive “organic” pineapple salsa. It was so smack full of onions that’s all I could taste! And yours doesn’t have ANY onions! Yay! SO up my alley. I’m on it! Thank you! Mouthwatering! This looks amazing. 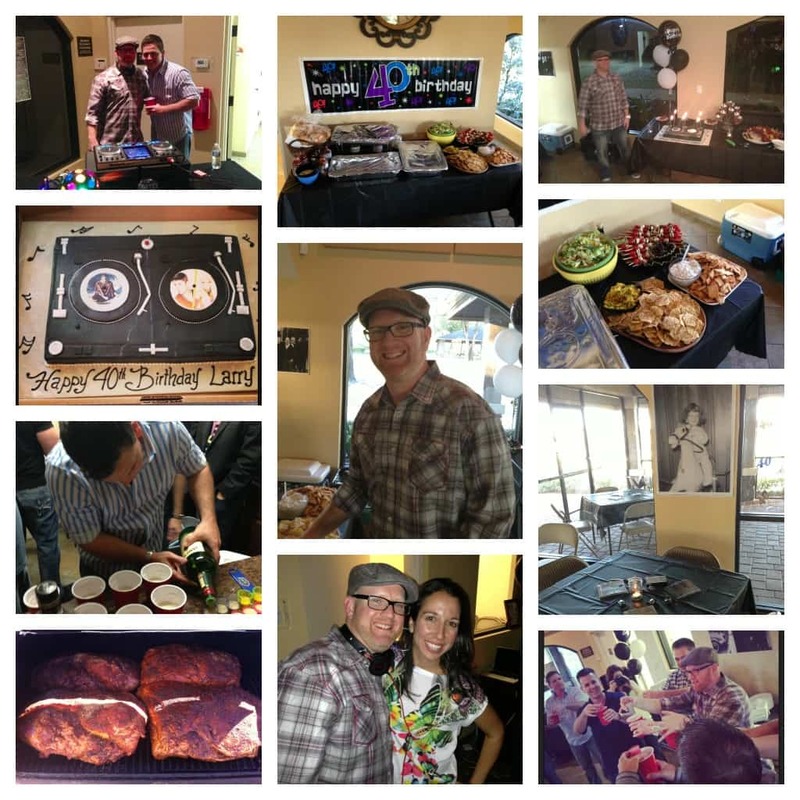 What a fun collage of pics from your party! Looks like a great time was had by all!! It sounds as though you guys are having a fun celebration week. Happy 40th to your husband! And this salsa looks so good…I’ll bet it’s great on fish tacos. Oh it would be SO good on fish tacos!! Love it. What a great gift you gave him in that party. Looks like he had so so much fun. I LOVE the food you served. And by the way GirlFriend, you look smokin’ in the pictures!!!! What a BLAST you guys had!!! Loving the photos and I want to eat every single thing you’ve described!!! So fun!! Happy 40th to your hubby! So glad he had a fun party!! Happy Birthday, Larry!!! And I love this salsa!! We’ll have to make it soon when we make fish next time! I was totally following along last weekend on instagram! Looks like he had a blast and this salsa looks amazing! Happy 40th to your hubby Aggie! What a fun party and birthday week! This salsa sounds really yummy – I would love it on some Shrimp Tacos. Happy 40th to your husband! It’ s a good year for turning 40! 😉 This salsa sounds so great and I know I would love it! What a great fresh salsa–thanks, Aggie. Happy 40th to your husband! I absolutely love fruit salsas! fruity salsa FOR THE WIN!! That salsa is definitley getting made ASAP! I have printed this recipe and will make it for when we have people over in a few weeks. I love cilantro, jalapeno, and lime! Combining all those flavors together with the pineapple is so intriguing. Thanks for posting this! I’m going to have to make this soon! Totally going to use it to top fish tacos! I just had to follow up…. I made this salsa today and I can’t believe how good it is! It is an amazing flavor burst with every bite. There is so much going on with the jalapenos, citrus, and cilantro, but it all works so perfectly together. LOVE IT! I was updating some things in this post (not the recipe) and I saw your comment – I just wanted to say so glad you enjoyed it (4 years ago lol)!! !